Haley was headed back to the White House for a national security meeting. United Nations Ambassador Nikki Haley Friday defended how long President Donald Trump is taking to decide on a potential military strike in Syria, saying she is “unbelievably proud” of how he has analyzed the situation and “not let anyone rush him into this." “If you rush decisions like this, you make a mistake," Haley said just before a UN Security Council meeting in New York on Friday. Afterward, Haley headed back to Washington, D.C., for a national security meeting about Syria at the White House. Haley highlighted “He [President Trump] has said from the beginning we have to know we’re right, we have to know all the information, we have to know there’s proof and we have to know that we’re taking every precaution necessary should we take action,” she said. Haley also said unequivocally “there is proof this happened” in regards to the chemical weapons attack. “Did a chemical weapons attack happen? Yes, the U.S. has analyzed, yes it has happened, the UK has analyzed, yes it has happened, France has analyzed, yes it has happened, three separate analysis all coming back with the same thing, there is proof this happened,” Haley said. Her remarks contrast what Defense Secretary Mattis told lawmakers Thursday during his testimony in a House hearing. Mattis said the U.S. did not have evidence yet and theOrganisation for the Prohibition of Chemical Weapons, OPCW, investigators were not yet, at that point, on the ground. Friday afternoon, State Department spokesperson Heather Nauert echoed Haley's assertion that the U.S. has proof of the chemical attack, but said the U.S. was still "looking into" "the exact kind, or the "mix" of chemical weapon that was used in Syria. “I’m not going to say which day we absolutely knew there was proof, the attack took place on Saturday, we know for a fact it was a chemical weapon, we know that there are only certain countries, like Syria, that have delivery mechanisms and those types of weapons," Nauert said. Nauert said the U.S. definitely has proof the Syrian regime carried out the attack in Douma. At the UN Security Council meeting Friday morning, Haley also made an attempt to justify potential strikes, laying out all the actions the Security Council has attempted to take to punish Assad that have been vetoed or blocked by Russia. “At some point, you have to do something. At some point, you have to say ‘enough.’ We saw what happened in Salisbury. This is a renewed effort to bring chemical weapons back into the mainstream and we can’t allow it to happen,” she said. 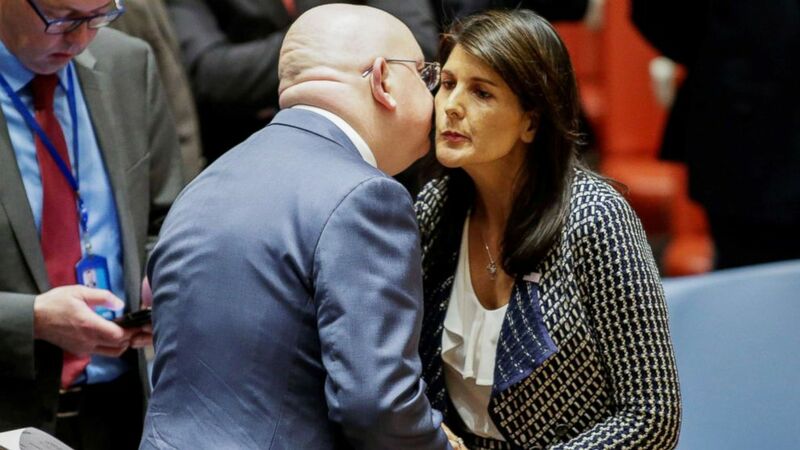 (Eduardo Munoz/Reuters) United States Ambassador to the United Nations Nikki Haley greets Russian Ambassador to the United Nations Vasily Nebenzya before the United Nations Security Council meeting on Syria at the U.N. headquarters in New York, April 13, 2018. Inside the meeting, Haley took a swipe at her Russian counterpart, Vasily Nebenzya, at the top of her opening remarks. What is the US-Russian hotline being used as possible Syria strike looms?